dressed up like a lady: Heat rises, which is why I'm wearing platforms. Heat rises, which is why I'm wearing platforms. Forgive the overblown nature of these pics. The settings on my camera can only compensate for so much, and besides, I know better than to complain about getting too much sun in Michigan. Bonus round: Let's see that with flats! I do try to be prepared for situations where sky-high heels aren't going to cut it, though usually that just means toting along my black Chucks. But I figured that when I actually make a modest attempt to match an alternate pair of walkable shoes to an outfit, that's worth including in a post, right? Love the shoes - very cute! Yowza. 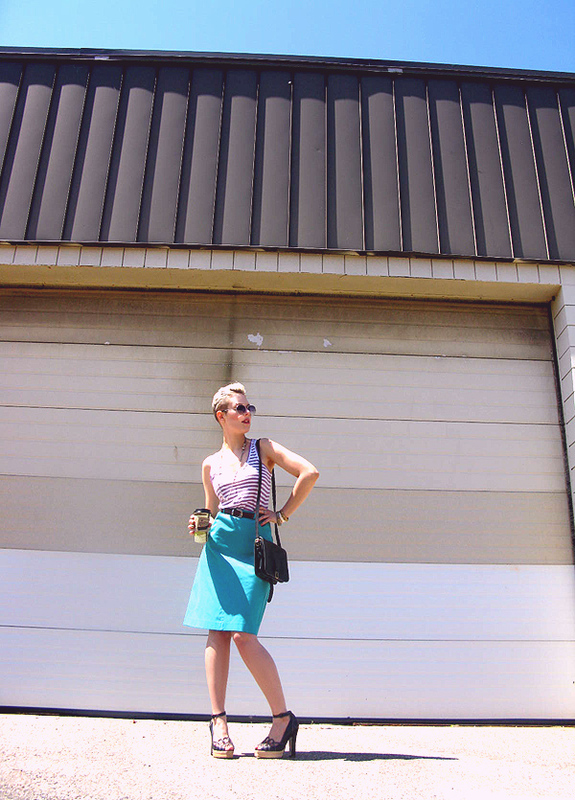 I'm currently obsessing over anything that shade of teal/aqua so it goes without saying that I'm madly in love with your skirt, and a bit jealous that you thrifted it. I always find pencil skirts and the like in the most gorgeous shades at the thrift but of course they never suit my overly-voluptuous curves. Maybe I should buy them anyways and send them your way. MC never ceases to impress me with his incredible style- both personally and in gift-giving form. Nail on the head, those shoes. You look fabulous. Also loving the bonus-round with the killer flats.